Book talk: Saba never imagined as she watched her apartment go up in flames that it would be the beginning of a grand mystery that would change her life for the better. Her school community rallies around her, led by two new kids who seem eager to make their mark. Saba's family moves into a luxurious apartment and an auction is organized to raise money for them. When the donation of a weird piece of art found in an alley turns out to be the work of a famous artist, tensions rise. Who should keep the money: Saba's family? The kids who found the art? The school? And just who set the fire in the first place? Read a series of notes, articles, and testimonies, put together the clues, and find out for yourself! Rave: I am a complete sucker for epistolary novels, so I naturally loved the format of this book! I find it especially effective in mystery narratives where not all the characters can be trusted and you have to be on a sharp lookout for red herrings. The characters are wonderfully diverse and layered and even the teachers are portrayed like real people--shocking I know! A major subplot of the book involves outsider art, an area that I found fascinating and was compelled to further research on my own. The final conclusion was perfect and a completely satisfying ending to a compelling mystery. Every book its reader: I'd give this to students 6th grade and up looking for a good mystery novel. Extras: The author has his own website with more information about the book and links to websites about outsider and folk art. 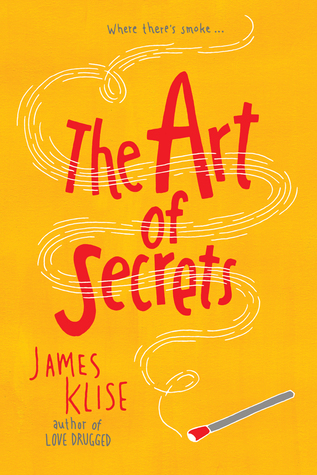 The Art of Secrets by James Klise: buy it or check it out today!